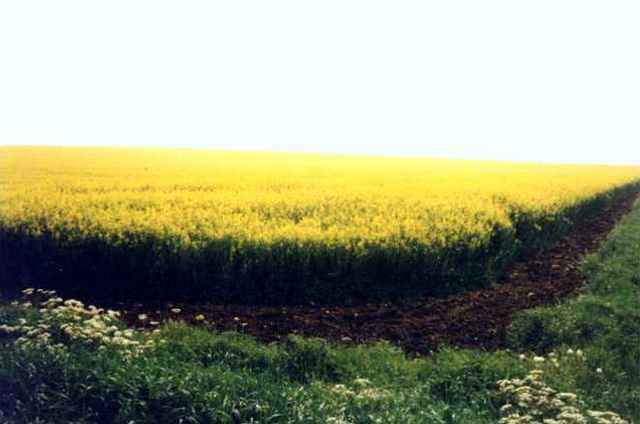 Heading up to Scotland from London in the spring of 1995, the weather was overcast but dry on the way up, and fields of mustard (right) were in full bloom waiting for the harvest. The cathedral in Lincoln (left) is magnificent. 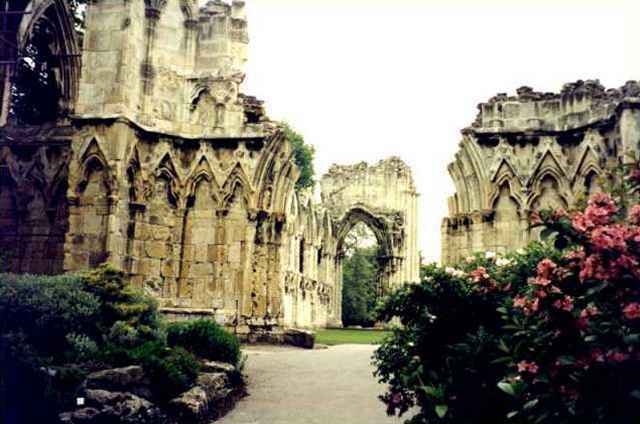 It contains the remains of Katherine Swynford, mistress (and eventually wife) of John of Gaunt. 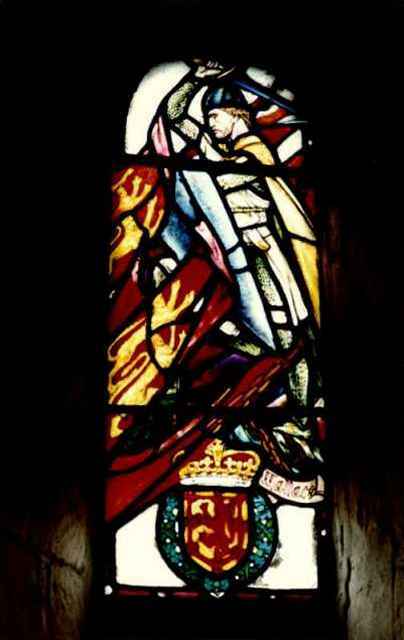 The claim of Henry VII to the throne under the Lancastrian banner stems from the children of this union. 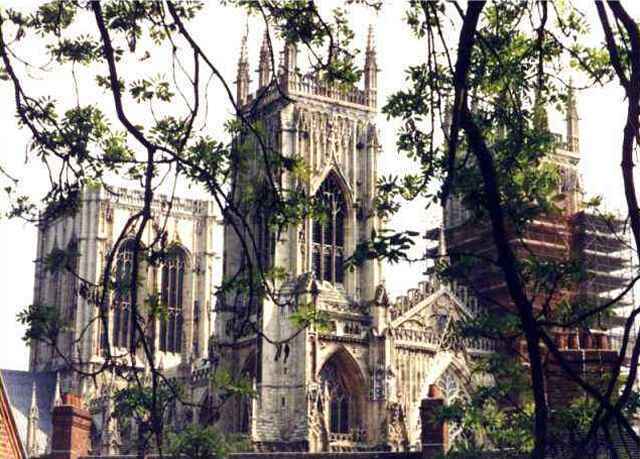 York is an old city with a fascinating history dating back to the Romans and before. Many ruins (such as top left) are within the city walls. 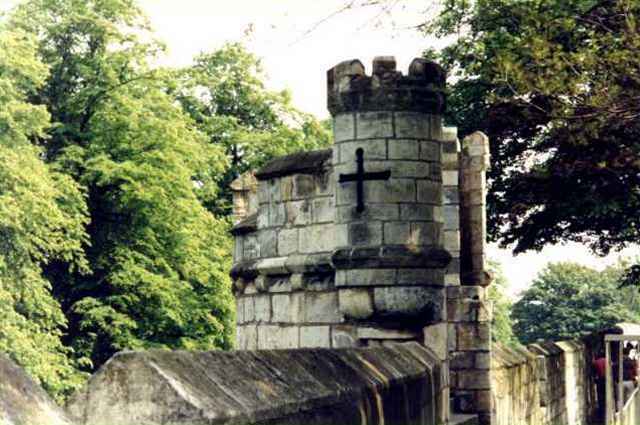 Much of the old city wall of York (bottom left) is still in place. 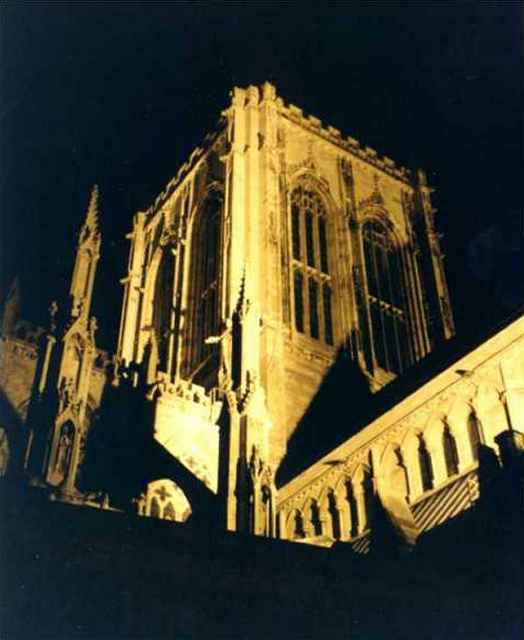 The York Minster (right) is the largest Gothic cathedral in Europe and is spectacular at night. There has been a Christian church on the site for more than 1500 years. 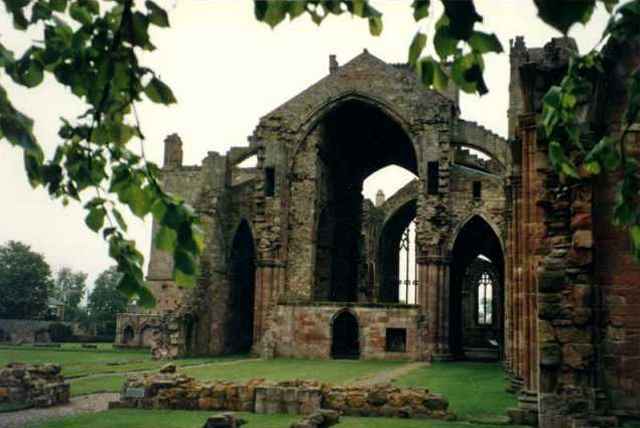 All along the border between England and Scotland are the ruins of abbeys and other church properties destroyed in the wars and border skirmishes of the centuries. 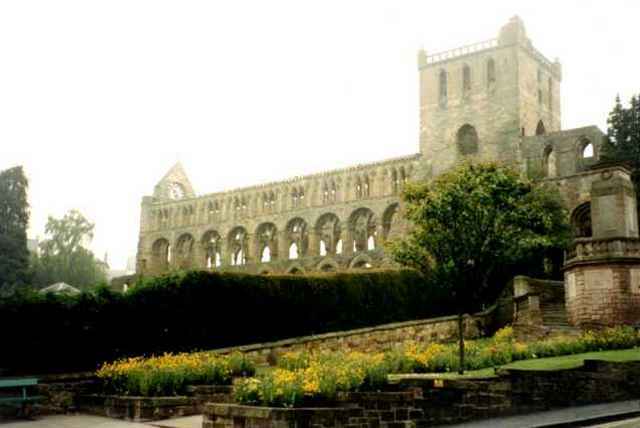 On the left, in a morning fog, is Jedburgh Abbey; on the right is Dryburgh Abbey. In the oldest section of the castle, which was never severely damaged or destroyed in any of the battles, is St. Margaret's Chapel. It's tiny, but worth the time to see: historical stained glass windows commemorating folks like William Wallace [photo left] can be found. 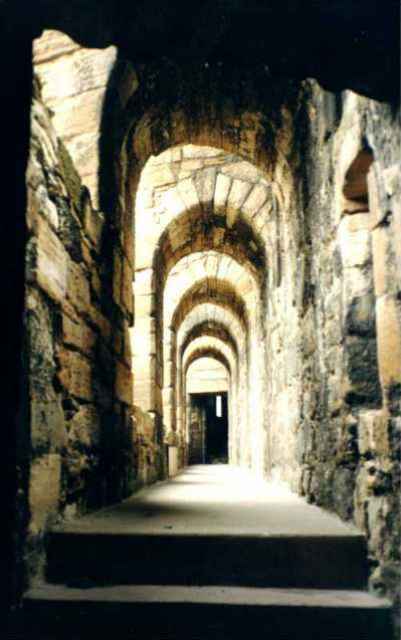 To get around, you walk through long cold stone halls [photo right] where you can almost hear the shouts of invaders and defenders. 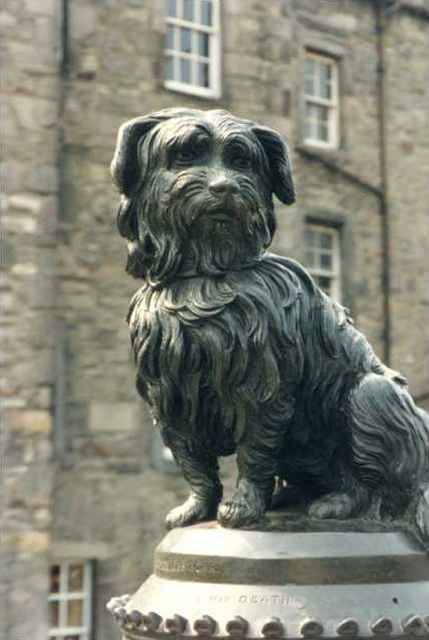 One of the sweetest stories you'll find in Edinburgh is that of Greyfriars Bobby. According to the story, in the 1860s, this Skye Terrier and his master, a shepherd named Jock, had lunch every day at the Greyfriars Inn. Bobby followed the funeral cortege into the churchyard but was chased away by the caretaker. But the next day, Bobby showed up as usual at the inn and begged for a bone. 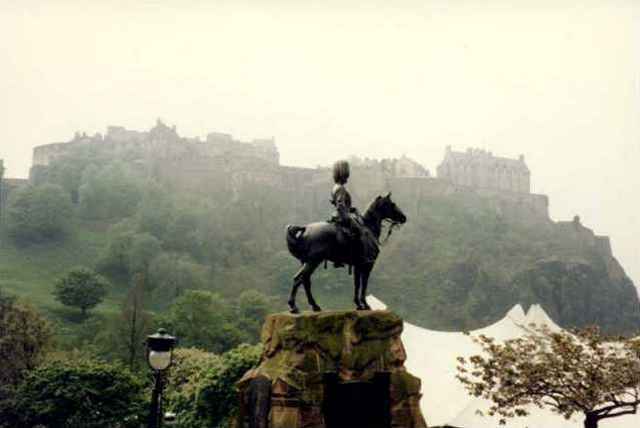 It turned out that Bobby was so loyal to his master that he had slept on his master's grave -- and continued to do so (having lunch each day at Greyfriars Inn) for 14 years until his own death.